We love this fish, and it comes from a sustainable eco-friendly farm. Here is what their website says about this beauty. Kona Kampachi® is a delicious, sushi-grade Hawaiian yellowtail, sustainably raised in the pristine open ocean off the coast of Hawaii. In the wild, Seriola rivoliana would be known as Almaco Jack or kahala, but Kona Kampachi® is substantially different from its wild counterpart. Kona Blue nurtures its Kona Kampachi® through its entire life cycle from hatch to harvest, yielding one of the healthiest and most delicious fish on the market today. Kona Kampachi® has a clean, rich but crisp taste that has no equal among raw fish. Its high-fat content (30%) creates a fish that is prized for its rich flavor and firm texture, and versatile enough for both raw and cooked applications. The succulent yet subtle flavor of Kona Kampachi® lends itself perfectly to sautéing, grilling, searing and roasting, as well as to sushi, sashimi and ceviche. Kona Kampachi® is also rich in healthy Omega-3 fish oils. And because Kona Kampachi® is fed high quality feed ingredients and nurtured from hatch to harvest in some of the cleanest water on Earth, it has no detectable levels of mercury or PCBs, and is completely free of internal parasites. Like hamachi (yellowtail), Kona Kampachi® is a premium fish worthy of the most discriminating sushi bar, but with even more rich, buttery flavor and a firmer texture. 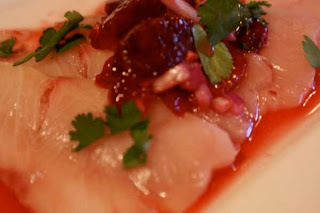 As delicious as it is raw, however, cooking is where Kona Kampachi® really excels. Firm flesh and a high-fat content make it suitable for virtually any cooking method, from gentle steaming to high-heat searing, and its subtly rich, pure flavor complements a variety of different culinary styles, simple and straightforward or spicy and complex. Small wonder that delicious Kona Kampachi® is receiving significant attention from a growing number of chefs who have been experimenting with it in poke and sashimi, as well as other Hawaiian fish preparations. And what started in Hawaii is turning into a mainland menu phenomenon, as more chefs discover this deliciously succulent and versatile product which can be the centerpiece of a signature seafood preparation, raw or cooked. Kona Kampachi® is harvested only when it's ordered to ensure the ultimate in freshness and is available on a year-round basis. For the trade, the fish can be processed to meet the requirements of our customers, and shipped in whole, gutted, H&G, or fillet product forms. We also sell Kona Kampachi® directly to consumers through our website as whole fish or fillets.